As a central gathering spot, your kitchen needs the right light to function as a space for dining, entertaining, meeting and working. Lighting magazine, presented by the American Lighting Association and Better Homes & Gardens, is a great resource for home decorating ideas and trends. While Lighting magazine is also available on newsstands and in bookstores for $6.99, you can request your free copy today from the ALA.
ALA-member showrooms have professionally trained lighting specialists to help you create your perfect space. Accent lighting can make the difference between a space that is purely functional and one that is elegant. One simple technique is to put LED strip lighting on top of cabinets or in the toe-kick of base cabinets. This is a good method for creating indirect lighting that is ideal for entertaining. LED lighting is fast-becoming an excellent option for kitchens, with LED bulbs available as undercabinet fixtures and even recessed lighting. LED has the same benefits of compact fluorescent, except that the bulbs last much longer. To learn more about LED lighting and all the latest, most stylish energy-efficient lighting fixtures, visit a Hortons showroom. While the average size of new homes is shrinking, the average kitchen size is growing. Just because a space is large, don’t just add more and larger lights. Use a minimum of three types of lighting. For example, using just rows of recessed lighting in today’s large kitchens will make the space seem very flat and one-dimensional. You need a combination, such as recessed with undercabinet or sconce lighting. Also, include at least one decorative element, such as a drum shade in the breakfast nook or mini pendants over the island. 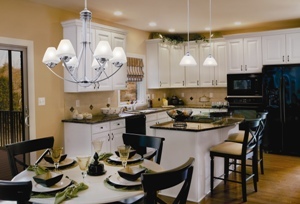 For expert advice on choosing the best light fixtures for your kitchen, visit a Hortons showroom.